The John Innes Centre team in the lab of Professor Sarah O'Connor followed clues from the recent past to identify the genetic networks behind a critical catalyst called a sarpagan bridge enzyme. Lead author of the paper Dr Thu Thuy Dang of the John Innes Centre said: "We set out to find the missing enzyme that catalyses this important reaction based on a 20-year-old clue from the literature. "Thanks to the new advancements in bioinformatic and biological chemistry approaches, we were able to identify the missing gene that encodes the enzyme among thousands of other genes from the plant." Prof. Sarah O'Connor added: "The discovery of the sarpagan bridge enzyme, together with other scaffold generator enzymes, will provide the parts necessary for assembling and engineering of metabolic pathways in organisms such as yeast or tobacco plants for mass production of pharmaceutically important compounds. We are currently collaborating with experts in synthetic biology and yeast engineering to push this forward." 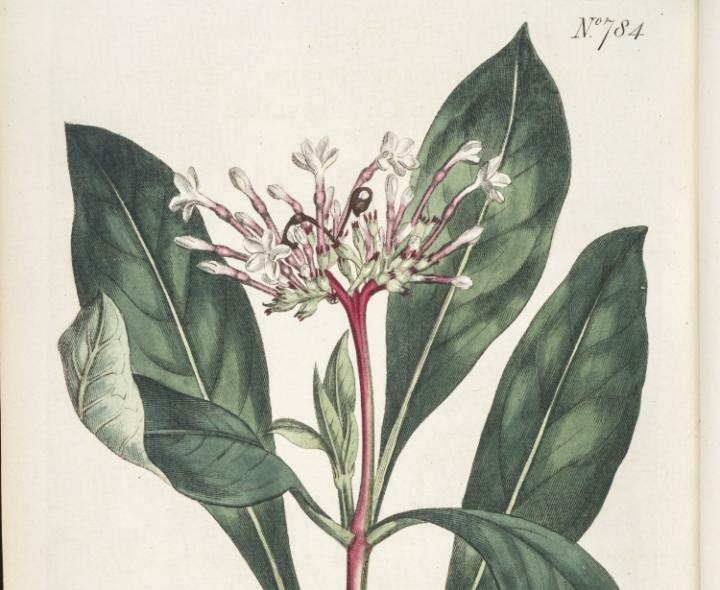 Indian snakeroot is one of the 50 fundamental herbs used in traditional Chinese medicine, where it has the name shég?n mù (Chinese: ???) or yìndù shémù (Chinese: ????). One of the best-known alkaloids in snakeroot is ajmaline, a class Ia antiarrhythmic agent often used in diagnosis of patients suspected of having Brugada syndrome, a condition that causes disruption to the heart's normal rhythm. Dr Jakob Franke said "The discovery highlights the versatility of this group of oxidative enzymes, which makes it a very useful biocatalyst and an excellent target for engineering these alkaloid pathways. We could use this enzyme to produce drugs in a much more elegant way than any synthetic chemist could." The full paper can be found in Nature Chemical Biology.